We’re excited that you’re considering chiropractic care for yourself and your family. Upon entering our practice, you’ll find our casual and relaxed waiting room the perfect place to center yourself before an adjustment. We always have Christian music playing as we focus on God leading our office with our mission of each patient experiencing peace, joy and healing every visit! If you haven’t already completed your new patient paperwork online, our front desk staff will provide it to at the time of appointment. After completing your paperwork, we’ll bring you back to sit with one of our chiropractors for an initial consultation. One of our Ankeny chiropractors or interns will discuss what it is that brought you in today and go over your concerns. Then, we’ll begin a few different examinations after you’ve changed into a comfortable gown. 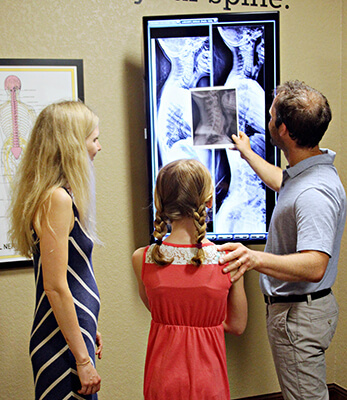 Your chiropractor will take digital X-rays, perform a postural and range of motion test, measure your muscle strength, complete a thermography scan and nervo-scope scan (we use the gowns, nervo-scope,and digital X-rays each visit in our office). Our goal is to make your diagnosis correct, and we do that through our state-of-the-art technology and testing. Sometimes we do not adjust patients on the first visit. It depends on our findings and time availability to review your findings and Xrays. After completing your X-rays (and adjustments if performed on the first visit), you’re free to go. Please reserve roughly one hour for this initial appointment. At your second visit to our practice, your chiropractor will review your report of findings with you. We’re big on education, and we want to make you an active partner in your chiropractic care with us. We encourage you to ask any questions that you have so we can move forward with you feeling 100% confident. When you’re ready, we’ll perform an adjustment and then have you schedule your next visits before leaving. During a regular visit, we will scan your back with our nervo-scope, check your walk (gait anaylis), palpate your back, utilize your digital Xray, adjust your spine and extremities, and re-scope your nervous system to make sure you’re leaving in the best shape possible! We also like to make sure your gait has improved. We’re thrilled to have the opportunity to meet you and your family on your journey to health and wellness. To get started, contact our practice today and book an appointment. We’re open early and late each day to better accommodate your family’s needs. We look forward to meeting you!